Are you that person who has a label printer and color-codes your highlights? If you are, good! You’re going to love this. If you aren’t, that’s ok too. You just need to realize the benefits of correctly organizing your website from the outset. Before you put a single word on your website, there are things you can do to get more traffic and cause that traffic to spend more time and money on your site. Today, I’ll show you those things. By the end of the module you’ll know all the right WordPress settings and how to optimize your about and contact pages. Why it’s important to set it up right? What’s the first thing you do when you get a new phone? If you’re normal, you spend about 30 minutes going through the settings and customizing everything to fit your phone habits and personality. It’ll make working on your site a lot more efficient. If you’re a predictive texter, it’s like switching the default texting setting to T9. A few of these changes will be based on personal preference. So your visitors won’t be instantly annoyed when they try to engage. A few of the default WordPress settings will make your visitors scrunch their noses at your site. So you can start building search engine rankings from the beginning. I wasted months of search engine juice because I didn’t make two of these changes. You’ll adjust your settings by clicking on the tab at the bottom, left-hand-side of the WordPress admin area. When you start installing plugins, more options will appear under your settings tab. Before you play a round of golf, you should at least know how to hold a club. Otherwise, you’re going to be putting a lot of effort into something that’s pushing you further from your goal. Likewise, the right settings will set a strong foundation for your website. I’ve bolded the settings you’ll need to check or change. Membership – Leave it unchecked for now. New User Default Role – Set to ‘Subscriber’ for now. Timezone – UTC-5 is EST. UTC-8 is PST. Week Starts On – Switch to Sunday, like most calendars. Jacob Cass’s tagline is “Graphic Designer, Logo & Brand Identity Specialist”. If you’ve never heard of him, his tagline gives you a good idea of exactly what he does. Plus, it’s stuffed with keywords that he wants to rank for. He shows up on the second page for ‘Graphic Designer’ – a highly-competitive keyword that is searched over 300,000 times per month. The JuniorBiz title tag is 'Business Tips for Young Entrepreneurs | JuniorBiz'. Press This – A cool app that helps you grab content from around the web and put it on your site. I’ve never used it. Post via email – A nifty function that lets you update your blog via email. Remote Publishing – A bit over my head. You can manually increase the size of your text area while editing a page/post by clicking and dragging the icon in the bottom-right of the text area. Try it in the text box above. For each article in a feed, show – This determines how people can read your RSS feed. Make it easy for people to read your content by leaving it at, ‘Full text’. Encoding for pages and feeds – Most likely, you’ll leave it at UTF-8. If you think you need to change it, you can find out here. If you want a static homepage (rather than your blog being the homepage), place the “Recent Posts” widget somewhere on your homepage so it will change as you update your blog. This will help with your SEO. Default article settings – Leave all of them checked. The first two let your blog interact with other blogs. The third one lets people engage with your content by leaving comments. Email me whenever – Uncheck both options unless you want a lot of emails. It’s easier to monitor your comments through your admin area. Before a comment appears – Uncheck “Comment author must…” so the commenters will see their comment immediately. This helps build trust with your community by showing that you trust them to leave legitimate comments. Plus, one of your plugins will remove comments that are blatantly spammy. Comment Moderation – Hold a comment in the queue if it contains ‘3’ or more links. Two is a little strict. Comment Blacklist – If you have someone who is consistently spamming your site, you can block all of their comments here. Avatars – Leave all of those settings unless you want people without Avatars to show up as monsters. You can choose to close comments on articles after “so many” days. Personally, I want people to comment no matter when they find the page. The benefit to closing comments is that it’s easier to monitor them if visitors can only comment on the latest posts. Image sizes – Thumbnail size is a cool feature that automatically resizes images (if you want). JuniorBiz is set at 66×66 pixels. I left Medium and Large at the defaults. Embeds – Automatically embeds video and other media when you link to it. For example, if you put the URL of a YouTube video in a post, WordPress will automatically embed that video into the post so readers can watch it without leaving your site. You can turn this off if you want. Uploading Files – This is the location where WordPress will upload your images and other media. It’s best just to leave as default. The reason you want to organize uploads by month and year is because browsers can navigate numeric-based folders faster than non-numeric folders. So they can fetch images, audio, and video faster. This decreases your load-time. Site Visibility – Leave the top one checked so search engines will index your site. If you plan on spending a few months constructing your site and don’t want people to find it yet, block the search engines. But make sure you change this when your site goes live. Another acceptable permalink structure is /%category%/%postname%/. This organizes your content by categories and adds another relevant keyword (the category name) to the URL, which might boost your ranking a bit. However, it lengthens your URL’s and it will murder your search engine rankings if you change your categories. Only do this if your categories are inscribed in stone. Even then, I’m convinced that /%postname%/ is best. Do you ever categorize your friends? You have your sports friends, video game friends, school friends, dress-up friends, and your best friends who you can talk to for hours. But they’re all your friends. Think of categories as the sub-topics of your website. If you want to run a blog, break down the main topic into five-ten different subtopics. If you’re making a website for you brick-and-mortar business, consider the different types of posts that you’ll want to write (e.g. Industry News, Events, Announcements, Special Deals, etc.). When establishing your categories, make sure every blog post you write can fall under at least one of the categories. Be mindful that the categories don’t overlap too much. If they do, consider combining them into one category. Every blog post should have one category. We’ll show you how to create your categories below. Michael Dunlop’s site, IncomeDiary.com, talks about how pros make money online. A few of his categories are: making money, blogging, traffic, increasing profits, branding, and entrepreneurship. He showcases each of those categories in his navigation menu. This lets people navigate through the categories they’re interested in. You can see it below. Michael put his categories in the navigation menu to help people find the content they want. Establish your categories before you write anything on your site. This process will help you flesh out your thoughts and it will give you a few ideas for your first blog posts. Plus, you’ll need to assign a category to a post before you publish it. Tags are less formal and more sporadic. Think of them as tiny-little subcategories. You’ll pick tags as you go. Once you associate a post with a few tags, those tags will show up at the bottom of the post. When you click the tags, you’ll be taken to an archive with all of the posts that have the same tag (e.g. http://juniorbiz.com/tag/blogging). Another popular option is to display a tag cloud where the most popular tags show up in the largest font. This gives readers a quick glimpse at what your site is about. Every blog post should have two-five tags. 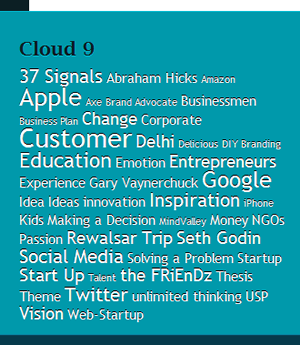 King Sidharth, a young entrepreneur from Chandigarh, India, has a tag cloud on his site, 64notes.com. At a quick glimpse you can see that he most often blogs about Apple, Customer, Education, Entrepreneurs, Google, and Social Media. King Sidharth's tag cloud on 64 Notes. When you tag your posts, make sure you always use the exact same tag. For instance, a post that is tagged as ‘design’ will be put into a different group than the ones that are tagged as ‘graphic design’. The about page is the 24th most popular page on JuniorBiz.com (out of 1,055). It’ll be one of your most popular pages as well. When I come to a new site, I’ll glance at the homepage and go straight to the about page. I want to know why this site exists and who is behind it. If it doesn’t answer those questions, I leave. The first thing people want to know is what the blog is about, what the company does, and why they should stick around. When someone first comes to your about page, the answers to these questions need to be above the fold. A good way to summarize your company is with your mission, vision, and values. 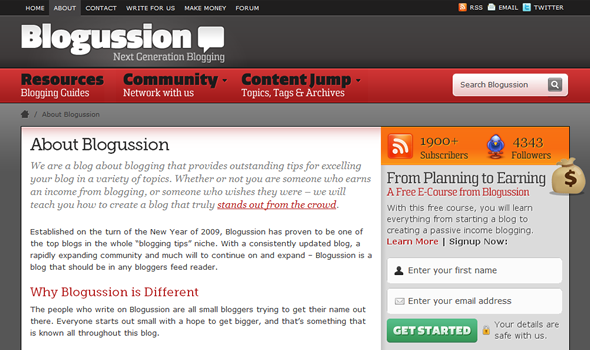 Alex Fraiser has done a great job of quickly explaining Blogussion’s mission and vision on their about page. You can see it below. After your visitor knows what the website is, they will want to know who’s behind it. This is your chance to introduce yourself, establish your credibility, and make a personal connection with the reader. Put a quirky but professional picture of yourself on this page. This is where you need to sell your story. People like to read stories. Don’t drag on too long about how awesome you are, but give them a few paragraphs to decide that they like you. I’ve read through Jacob Cass’s about page a few times. He has a cool story and an incredible about page to communicate that story. See it below. Blogussion's about page starts by detailing Alex's mission and vision. Link to more info about your story – To allow them to engage with your story in more detail. Video of you – There’s no better way to introduce yourself online than with video. Team members/other contributors – To show that there are a few people behind what they see. Testimonials – To show people what others think about you. Subscription area – To capture more leads. Press mentions – To further establish your credibility. High-resolution photos – For the press or other websites to use in interviews. The main goal of your about page is to creatively express your personality. This is where you start building trust which leads to authority which leads to sales. People trust people, not companies. Michael Dunlop told us that his About page is the second most trafficked page on IncomeDiary (second to the homepage). It’s so important to his success that he even links to it at the top of his sidebar. Title your about page, ‘About’. ‘About Us’ is becoming passé and ‘About’ just looks cleaner. Bonus tip! Don’t use ‘we’ if you’re the only person in your company. Be transparent with your visitors and take pride in the fact that you’ve done everything yourself. A website without a contact page is like a race without a finish line. Getting people to connect with you and your business is the end-goal. Most people will contact you through the contact form, but some people prefer to copy/paste then email you. This way they can keep a record of the email they sent. But you also want people to connect with you through social media. So include links to your Facebook, Twitter, LinkedIn, Skype, etc. Let them connect with you how they want to connect with you. To prevent spammers from harvesting their email addresses, a lot of people list their email address as “name AT domain DOT com” (rather than name@domain.com). In actuality, this makes it easier for people to find your email because search engines don’t index symbols like “@”. If you want to make it almost impossible to harvest your email, put it on your site as an image. Otherwise, “name@domain.com” will be just fine. A contact form gives them the ability to email you without having to leave your website. We’ll show you how to easily do this while keeping the spammers out below. 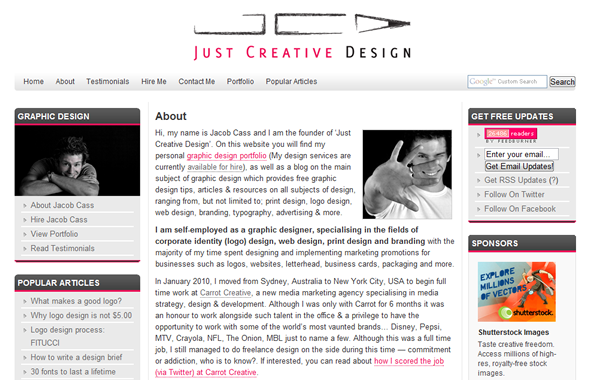 The purpose of Jacob Cass’s site is to capture design leads. So his contact page is very important. He starts by giving them his personal email address, then he has a contact form, then all his social media accounts, and he wraps it up with a call-to-action to hire him through his “Hire me” page. One of the best ways to build your fans and followers is to let people Like and Follow without having to leave your website. Next week, we’ll show you how to set up Facebook Connect and Twitter Connect so you can put these on your contact page. Go through the Settings area and make all of the necessary changes (General > Writing > Reading > Discussion > Media > check Privacy > and Permalinks). Choose 5-15 categories for your site. Then click Post > Categories and add your categories there. Make sure to list a Name, Slug, and Description for each. Once you create them, you’ll be able to choose one from the list when you add a new post. Write your about page by starting with “About the website/company” then “About the author/owner”. Write this in third-person. Then go to Pages > Add New and copy/paste what you wrote into the HTML editor. Title it ‘About‘, clean up the code and add your picture. Make sure the slug is ‘about’ and click Publish. To put a form on your contact page, you need to install the Contact Form 7 plugin. To do this, click Plugins > Add New > Search “Contact Form 7” > find the right one (might be on 2nd page) and click Install Now. Activate Plugin. You can add a CAPTCHA form to prevent spammy emails by using the Really Simple CAPTCHA plugin (Recommended). P.S. This page is just one bite of a complete guide to making an awesome website. Hungry for more? You’ve got a design on your website but, next time, we’ll show you how to optimize your site so you can get more traffic and monitor that traffic with Google Analytics. In the meantime, you can learn more and sign-up for the full-course meal here.